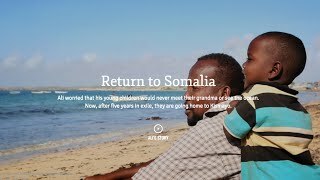 Over two million Somalis remain trapped in what is one of the world's most protracted displacement situations, lasting over two decades and impacting three generations. Approximately 1.1 million Somalis are displaced within Somalia. Nearly one million are refugees in the surrounding region: 12,044 in Djibouti, 420,711 in Kenya, 249,350 in Ethiopia, 32,447 in Uganda and approximately 240,000 in Yemen. Tentative security and political gains in Somalia, along with growing pressures on hosting countries, makes this a critical moment to renew efforts to find durable solutions for Somali refugees. Seeking international support towards the above goal, the UN High Commissioner for Refugees and the European Union, in partnership with the Republic of Kenya and the Federal Republic of Somalia, hosted a Ministerial Pledging Conference on Somali Refugees in Brussels on 21 October 2015. The conference was attended by over 50 States and organisations. An Action Plan was presented at the conference, having been prepared within the framework of the Tripartite Agreement on Voluntary Repatriation of Somali Refugees from Kenya by the Governments of Kenya and Somalia, and UNHCR, with strong collaboration from a range of humanitarian and development partners. Financial pledges of EUR 94 million (USD 105 million) were made by donors towards the Action Plan. *UN exchange rate used for pledges made in currencies other than USD. In addition, a non-financial donation was made by the American Refugee Committee to offer livelihoods training to 10,000 young Somali returnees. Many delegates made statements in support of the Action Plan and may offer financial support in the coming months. Conference documents and the conference video are posted on this site. For any further queries, please write to the conference email.